There is still so much to digest from the papal visit. It will take time to take it all in - even as churchy attention moves on to the Synod next month and the Year of Mercy soon to follow. Today, however, as the Church celebrates the feast of Saint Michael the Archangel, I find myself looking inward - looking back almost 60 years to September 22, 1957, the day I took Michael as my confirmation name. In any case, for most of us back then (and perhaps still today for many), more or less the biggest thing about confirmation was choosing a new name. As I recall, my mother had had some initial reservations about my choice of Michael, but she eventually gave in to my persistence in this matter. In fact, my father had had a brother named Michael, but he had died young, and I had never known him. I chose the name not because of any relative or family connection but because I really liked the Prayer to Saint Michael the Archangel, which we used to recite in English after all Low Masses in those days. who wander through the world seeking the ruin and destruction of souls. Amen. The blandness of that sacramental formula says a lot about how hard it has been to find ways to express the sacrament’s meaning in the centuries since it was detached from the sacrament's initial role in Christian initiation. But, however bland the celebration may have seemed, to me my name (which was what I cared most about) was most certainly not bland at all. In Michael the heroic archangel who led the angelic army to victory over the Devil, this wimpy, nerdy kid had found himself a suitably macho figure to identify with, in a way which also appropriately affirmed my religious interests and inclinations. Of course, it didn’t occur to me until someone pointed it out to me years later that there could be something problematic in adopting as my model of masculinity someone who by definition had no body and so was only notionally male! But then I was only nine at the time! Such psychological complications aside, choosing Michael as my confirmation name equipped me with a devotion to the Archangel Michael which I have never abandoned. I still like to pray (privately, of course, now that it is no longer recited after Mass) the prayer to Saint Michael to defend us in battle. and I remain confident in his power to do so! It will take time to process the experience of this papal visit. Four popes have now visited the US - one of them (Saint John Paul II) more than once. In each case, the visiting pope was rapturously received, even Paul VI and Benedict, who were both much less personally charismatic than either John Paul or Francis. All those visits were considered successful at the time. Evaluating or analyzing longer terms consequences is another matter - much harder to judge, if indeed it is possible to do so at all. That is so mainly because the primary impact of such an occasion is spiritual and takes place in the hearts and minds of those whose souls have been somehow touched by the event. For the many thousands who attended Pope Francis's Masses in Washington, New York, or Philadelphia, or any of the other events at which he spoke, or who watched his motorcade pass by the experiences was likely a once-in-a-lifetime sort of event - a spiritual "high" in which even those who were not physically present but who watched on TV could feel themselves participants and be touched by the spiritual power at work in the event. There is no way of knowing how many people were uplifted in some way, who felt God's grace at work in them - or who will feel that later in life as a result of participating in this event. There is no way of knowing how many were touched in various human ways, how many felt invited to re-examine an old faith or consider it anew. There is no way of measuring the Pope's impact on the main focus of his visit - families. That includes stable families, struggling families, untraditional families, etc. The many movements of grace that may have been at work this past week will hardly ever in this life be fully known to us, let alone be measurable by us! But for all of them we ought to be truly grateful. The more public consequences of the Pope's trip are obviously more susceptible to analysis and measurement. While Congress stood and applauded the Pope's invocation of the Golden Rule, it remains to be seen whether and how our public officials will be guided by that Golden Rule in their treatment of immigrants and the marginalized - or even in their treatment of one another. Past experience is not so encouraging in this regard. On the other hand, hope is one of the highest virtues! Secular society was certainly an object of the Pope's solicitude during his visit, but so too in an even more special and obvious way was the Church community - in particular the Church in the United States. The Catholic community in the United States - bishops, priests, religious, and lay - have all been challenged (as I said in my homily yesterday) to listen to a new note, to hear in a new way, and to open a new door (or, to use Pope Francis' chosen image, to break down some walls). In a particular way, these six amazing days have been an invitation to the Church in the US to re-examine its pastoral priorities and institutional activities to align more closely and effectively with the priorities Pope Francis has articulated for the Church. Of course, different people will respond differently to the movements of grace, and there will always be a diversity of vocations in the Church focusing on different dimensions of the call of discipleship. Not everyone is called to do exactly the same things or even to care about all the same things with exactly equal intensity. Even so, the challenge to the American Church as a public institution in society - and to her pastors at all levels - is to teach and practice the particular priorities the Pope has highlighted for us this week - among them, certainly, immigrants, the environment, the death penalty, and a certain sort of pastoral stance in regard to how the teaching of the Church is presented and practiced in the public square. There is certainly a lot there to start with! Watching Pope Francis this past week and listening to his words – above all his address to the United States Congress – I could not help but recall something Servant of God Isaac Hecker said to Blessed Pope Pius IX on December 22, 1857. In response to Pius IX’s concern about social and political conflict in the United States, Hecker answered, "there is also the Catholic truth, which if once known would come between these two parties and act like oil on troubled waters; and ... sustain our institutions and enable our young country to realize its great destiny." Watching Pope Francis in Washington and New York and Philadelphia, I almost felt as if Hecker’s hope for the Catholic faith’s positive impact on American culture could be coming true. Speeches alone don’t solve problems, of course - much less accomplish the kind of conversion of heart that solving our country’s and the world’s problems calls for. But a speech can be an invitation to listen to a new note, to hear in a new way, and to open a new door (or, better, to use the image Pope Francis used yesterday in Philadelphia, to break down some walls). That was what Jesus did in today’s Gospel [Mark 9:38-43, 47-48] in response to his disciples’ narrow-minded reaction to the unnamed “someone” they had caught casting out devils in Jesus’ name. That was what Moses did in the earlier Old Testament instance of Joshua’s jealous reaction to Eldad and Medad prophesying in the camp [Numbers 11:25-29]. I think we can all recognize some of ourselves in the behavior of the disciples and Joshua. Jesus’ response – like that of Moses before him – challenges to listen to what this kingdom of God he keeps talking about is really all about, to hear him in a new way, and to open a new door to a hurting world (or, again as Pope Francis has suggested, to break down some walls). Like members of any adolescent club or any adult society, the disciples were obsessed with distinguishing who’s in from who’s out, who’s rich from who’s poor, who’s native from who’s foreign, who belongs from who doesn’t. And, of course, our world – the world we human beings have become increasingly comfortable with – our world is all about building barriers and borders, walling ourselves off from one another. But there is an alternative as Jesus showed his disciples, as Pope Francis has invited all of us (even the Congress of the United States) to rediscover. It was labelled as a talk on Religious Liberty with Hispanic and Other Immigrants. At first it sounded to me as if perhaps there wasn't enough time for two separate events (one on religious liberty, another for Hispanics and other immigrants), and so they were just artificially combined. I even entertained the suspicion that this was deliberately designed a something for everyone sort of event - religious liberty for those on the political right, immigrants for those on the political left. If that was anyone's plan, it was well and cleverly done! For someone with no previous US experience, Pope Francis has really studied up on American history and political thought and so turned this event into another astounding success. The audience were all largely Hispanics and other immigrants. The Pope addressed them directly and spoke in Spanish, both in his informal interaction beforehand and in his formal remarks. And he based his talk on the text adopted 239 years ago in the very building he was standing in front of. And he stood at the same that Abraham Lincoln had used at Gettysburg, "fourscore and seven" years later, when he used that Declaration's principles to re-interpret the constitution and invest the Civil War with a transcendent meaning. The Pope began by referencing - and endorsing - the Declaration's premise that "all are created equal, that they are endowed by their Creator with certain inalienable rights, and that governments exist to protect and defend those rights." He then went on to highlight the historical struggles required throughout our nation's history to embody those principles in practice. "We remember the great struggles which led to the abolition of slavery, the extension of voting rights, the growth of the labor movement, and the gradual effort to eliminate every kind of racism and prejudice directed at successive waves of new Americans. This shows that, when a country is determined to remain true to its founding principles, based on respect for human dignity, it is strengthened and renewed." In just one sentence, he liked the great struggles of abolitionism, civil rights, the labor movement, and the struggles of acceptance and inclusion that every immigrant group has had to go through, and in the second sentence asserted the benefit this process of inclusion and expansion of the political community has been for society as a whole - a point apparently much in need of being regularly repeated. Then he turned specifically to the topic of religious freedom as both a core dimension of human existence and a profound benefit to society. it was a short but rich explication of the fundamental essence of what religious freedom is and why society should value it. "Many of you have emigrated to this country at great personal cost, but in the hope of building a new life. Do not be discouraged by whatever challenges and hardships you face. I ask you not to forget that, like those who came here before you, you bring many gifts to your new nation. You should never be ashamed of your traditions. Do not forget the lessons you learned from your elders, which are something you can bring to enrich the life of this American land. I repeat, do not be ashamed of what is part of you, your life blood. You are also called to be responsible citizens, and to contribute fruitfully to the life of the communities in which you live. I think in particular of the vibrant faith which so many of you possess, the deep sense of family life and all those other values which you have inherited. By contributing your gifts, you will not only find your place here, you will help to renew society from within." It's always nice to be affirmed, but especially in this contentious political climate it must mean a lot to be told that you bring something of value to this society. Of course, that has always been the case. But, instead of appreciating that, there is once again a growing tendency to see immigrants only as problems, rather than as the gifts they actually are. Like the nation as a whole, the Church in the United States has also had to learn this lesson over and over - from 19th-century Italian immigrants struggling for a place in an Irish-run local Church to today's Latino immigrants who are increasingly re-energizing a Church that at times seems to be losing its vitality and the fullness of its missionary possibilities. At Madison Square Garden in Manhattan last night, fresh from his visit to Our lady of Angels in East Harlem and his triumphal procession through Central Park, Pope Francis celebrated his only public Mass in New York. During his homily, he spoke about city life - a fitting topic for a day in the great city, especially for someone who grew up and eventually served as Bishop of Buenos Aires, one of South America's greatest cities. Like my family and like so many other families through all of history, Jorge Bergoglio's family found a home and a life in a big city. Since time immemorial, people have flocked to cities for the fuller human life which cities uniquely make possible. Big cities, Poe Francis told his Madison Square Garden congregation, "are a reminder of the hidden riches present in our world: in the diversity of its cultures, traditions and historical experiences. In the variety of its languages, costumes and cuisine. Big cities bring together all the different ways which we human beings have discovered to express the meaning of life, wherever we may be." Of course, along with increased opportunities for human fulfillment, there are always the challenges to realize those opportunities despite the deprivations of inequality. In big cities, the Pope warned, " so many faces pass by unnoticed because they have no 'right' to be there, no right to be part of the city. They are the foreigners, the children who go without schooling, those deprived of medical insurance, the homeless, the forgotten elderly. These people stand at the edges of our great avenues,in our streets, in deafening anonymity. they become part of an urban landscape which is more and more taken for granted, in our eyes, and especially in our hearts." The solution to this deformation of city life is, of course, the common solution to all our deformations. "Knowing that Jesus still walks our streets, that he is part of the lives of his people, that he is involved with us in one vast history of salvation, fills us with hope. A hope which liberates us from the forces pushing us to isolation and lack of concern for the lives of others, for the life of our city." City life naturally predisposes us to community. Hence, the social (as well as environmental) damage done to human life in the 20th century by the automobile and the consequent suburbanization of our nation. The human city is the natural analogue of heavenly city of Revelation. We are being prepared here and now for the fullness of life in that heavenly city by how we experience and respond to the opportunities and challenges of living and connecting with one another here and now in the human city. Today, Pope Francis moves on from New York to another classic American city, Philadelphia, the city which played such a significant role in the initial realization of the American dream - and such a significant role in the early life and mission of the Church in this country. For the fifth time in 50 years, a Pope has addressed the United Nations General Assembly. The first was the spectacular - spectacular because of the novelty of such trips at that time - visit to the UN of Blessed Pope Paul VI almost exactly 50 years ago on October 4, 1965. That was followed by three more such speeches - by Saint John Paul II in 1979 and 1995 and Benedict XVI in 2008. Today, Pope Francis has continued that tradition - continuing too the long-standing tradition of exaggerated enthusiasm for the UN on the part of the Holy See - exaggerated because of the great gap between the Holy See's estimation of the UN's accomplishments and the actual reality of its 70 years. Thus it was to no one's surprise when the Pope praised the UN's achievements as "lights which help to dispel the darkness of the disorder caused by unrestrained ambitions and collective forms of selfishness." conceding that "many grave problems remain to be resolved," the Pope affirmed that, without the UN's "interventions on the international level, mankind would not have been able to survive the unchecked use of its own possibilities." It is easy to pass over that as ritual rhetoric adapted to the setting, but still it is a most astonishing claim! All in all, another excellent presentation of key components of the Catholic outlook on world politics and international relations! Later this afternoon, the Pope went up to Our Lady of Angels School in East Harlem to see Catholic education and Catholic Charities at work in the schools and social services of the archdiocese of New York. Surrounded there by immigrants and the children of immigrants, Pope Francis certainly seemed to enjoy himself, while providing the secular world with a more living window into Catholic social teaching! I am no fan of sports metaphors and generally prefer to avoid them, but I will use one today to say that Pope Francis hit it out of the park when he addressed Congress this morning! It was a scene that would have been utterly unimaginable for most of our country's history, including much of our recent history! And yet when this great day came, Pope Francis brilliantly clothed his remarks in the best of American history, tradition, and values - as if to say, it's not impossible to address these pressing problems, you really can do this, America, if you put aside your divisions and try! Anticipating his address, there was some anxiety that the Pope would come across as a scold - and indeed there is much to scold our political leaders (and us citizens) about, on both sides of the aisle. But having accepted the Speaker's gracious invitation, Pope Francis was not one to respond ungraciously. He was polite, as befits a guest. Instead of scolding, he challenged, but gently by way of an invitation - an invitation to dialogue, to conversation focused on the common good, formulated in terms that could appeal to the very best about America and its history, tradition, and values. He may be a stranger to the US, but he obviously did his homework and succeeded in making a profound connection with America's soul. After breaking the ice, so to speak, by quoting our national anthem (something that got even the usually very reserved Supreme Court Justices to applaud), he offered his audience the briefest of introductions to Catholic political theory. ("You are called to defend and preserve the dignity of your fellow citizens in the tireless and demanding pursuit of the common good.") Then, after making another connection with Congress by invoking the figure of Moses, whose image adorns the House chamber, he invited us all into a dialogue through our national "historical memory," invoking four outstanding Americans - Abraham Lincoln, Martin Luther King, Dorothy Day, Thomas Merton. Wherever he got that idea, it was brilliant! Invoking those great Americans - Lincoln and King, who are certainly familiar to all, and Dorothy Day and Thomas Merton, members of this country's Catholic sub-culture who offered alternative models "of seeing and interpreting reality." Through the resonance of their stories, Pope Francis was able to address several specific concerns that are close to his heart - among them, overcoming polarization through dialogue and commitment to the common good, immigrants, the poor, the environment, the defense of human life, opposition to capital punishment and the arms trade, and the threats facing the family. Undoubtedly there was and will continue to be disagreement among his audience, some favoring some of his concerns but not others. But, after this address, no one on any side of any of these issues should be able to doubt or relativize the Pope's priorities. "A nation can be considered great," he concluded, "when it defends liberty as Lincoln did, when it fosters a culture which enables people to 'dream' of full rights for all their brothers and sisters, as Martin Luther King sought to do; when it strives for justice and the cause of the oppressed, as Dorothy Day did by her tireless work, the fruit of a faith which becomes dialogue and sows peace in the contemplative style of Thomas Merton." Ad honórem Sanctǽ et Indivíduǽ Trinitátis, ad exaltatiónem fídei cathólicæ et vitæ christiánæ increméntum, auctoritáte Dómini nostri Iesu Christi, beatórum Apostolórum Petri et Páuli ac Nostra, matúra deliberatióne præhábita et divína ope sǽpius imploráta, ac de plurimórum Fratrum Nostrórum consílio, Beátum Iuníperum Serra Sanctum esse decérnimus et definímus, ac Sanctórum Catálogo adscríbimus, statuéntes eum in univérsa Ecclésia inter Sanctos pia devotióne récoli debére. In nómine Patris et Fílii et Spíritus Sancti. That's what infallibility sounds like! And what a glorious day it has been for the Catholic Church in America, as Pope Francis definitively defined that the great California missionary Junípero Serra, who represents that state in the U.S. Capitol's Statuary hall (photo) is - and henceforth shall be venerated as - a Saint. Saint Junípero (1713-1784) founded 21 missions in California between 1769 and 1782, from which would develop some of that state's major cities, such as San Francisco, Santa Clara, Santa Barbara, and San Diego. As the Prophet Isaiah said, in the reading proclaimed at this afternoon's canonization Mass: How beautiful upon the mountains are the feet of him who brings glad tidings, announcing peace, bearing good news, announcing salvation, and saying to Zion, Your God is King! Saints are our brothers and sisters in Christ, made exemplars and intercessors through the power of God's grace working in and through them for the building up of God's kingdom. In his homily at this afternoon's Mass of canonization, Pope Francis warned against apathy. "What can we do," he asked, "to keep our heart from growing numb, becoming anesthetized? How do we make the joy of the Gospel increase and take deeper root in our lives? His answer: mission. "A Christian finds joy in mission: Go out to people of every nation! A Christian experiences joy in following a command: Go forth and proclaim the good news!" In Saint Junípero Serra, we have an exemplar of such a life. Saint Junípero "was the embodiment of 'a Church which goes forth', a Church which sets out to bring everywhere the reconciling tenderness of God. Junípero Serra left his native land and its way of life. He was excited about blazing trails, going forth to meet many people, learning and valuing their particular customs and ways of life. He learned how to bring to birth and nurture God’s life in the faces of everyone he met; he made them his brothers and sisters." The Pope concluded his homily by invoking the new saint's motto: siempre adelante ("Keep moving forward!) amd proposing it for the church today. "For him, this was the way to continue experiencing the joy of the Gospel, to keep his heart from growing numb, from being anesthetized. He kept moving forward, because the Lord was waiting. He kept going, because his brothers and sisters were waiting. He kept going forward to the end of his life. Today, like him, may we be able to say: Forward! Let’s keep moving forward!" Unlike the official ceremonial state welcome this morning, the Pope's arrival at Andrews yesterday afternoon was simple - almost informal. The President brought his daughters and mother-in-law to meet the Pope - and the Vice President brought his two granddaughters - a fittingly familial welcome for a Pope whose primary purpose in visiting is to address the World Meeting of Families later this week. And the Pope's last public talk in Cuba was also a plea to value family. It is in the family, he said in Cuba, that "we learn fraternity, that we learn solidarity, that we learn not to be overbearing ... that we learn to receive, to appreciate life as a blessing and to realize that we need one another to move forward. ... that we experience forgiveness, that we are continually asked to forgive and to grow." In contemporary post-monarchies like the United States, a state visit is one of the few occasions when what Walter Bagehot famously called the "dignified" dimension of politics is on display. And on display it was with the traditional, formal state ceremony of official welcome of the Pope by our Head of State. President Obama is fond of making reference to his favorable experience of the Catholic Church while working as a community organizer in Chicago. Obviously, it really did have some impact. On occasions such as this (and earlier, for example, his 2009 Notre Dame speech), it enables him to speak easily and eloquently in ways which his more normal posture as spokesperson for america's post-modern, secularist, elite culture does not typically allow. Thus, in his official address of welcome, the President praised the world-wide work of Catholic organizations that "serve the poor, minister to prisoners, build schools and homes, and operate orphanages and hospitals." He praised the Pope personally for reminding "us that in the eyes of God our measure as individuals, and as societies, is not determined by wealth or power or station or celebrity. but by how well we hew to Scripture's call to lift up the poor and the marginalized, to stand up for justice and against inequality, and to ensure that every human being is able to live in dignity - because we are all made int he image of God." In particular, he noted the Pope's contribution to "our new beginning with the Cuban people" and his message of "welcoming the stranger with empathy and a truly open heart." The President spoke strongly of the universal value of religious liberty and specifically mentioned how "at this very moment" Christians "are targeted and even killed because of their faith." Finally, he expressed support for the Pope's "call to all world leaders to support the communities most vulnerable to a changing climate and to come together to preserve our precious world for future generations." In his response, Pope Francis immediately - literally in his second sentence - mentioned his own background as a son of immigrants and how America "was largely built by such families." For someone who has never before been to the US, the Pope obviously appreciates a fundamental feature of American identity - despite the xenophobia which presently threatens that identity in certain circles. The Pope also spoke of the centrality of religious liberty - and related that concern to a commitment "to building a society which is truly tolerant and inclusive, to safeguarding the rights of individuals and communities, and to rejecting every form of unjust discrimination." Unsurprisingly, the Pope pressed the urgency of responding to climate change.as "a problem which can no longer be left to a future generation." Again,showing a sensitivity to American history and to his immediate audience, he quoted Martin Luther King's famous reference to having "defaulted on a promissory note and now is the time to honor it." It was exceptionally edifying hear both Pope and President singing from the same hymnal, so to speak. It was a most promising beginning to this visit. And it reminded me of Servant of God's promise to Blessed Pope Pius IX, on December 22, 1857, that "Catholic truth" would "act like oil on troubled waters ... to sustain our institutions and enable our young country to realize its great destiny." That would be the Pope, of course, who is coming to America later today. And, unlike most Heads of State, who have to wait to meet the President at the formal White House welcoming ceremony, Pope Francis (who will still get the full ceremonial pageantry at the White House tomorrow) will be met by the President himself at the airport - a sure sign of how powerfully this visit resonates politically as well as religiously. Of course, the distinction between political and religious is itself somewhat artificial, and almost everything about the Pope's trip first to Cuba and then to the United States will hopefully help to undermine that historically and philosophically artificial distinction. In any case, the Pope is coming, and there is excitement and anticipation in the air. Also, opposition to the Pope's presence and message has begun to get vocal. Perhaps unsurprisingly, the so-called "Freedom from Religion Foundation" is objecting to New York city's awarding of some 80,000 tickets to see the Pope's procession pass through Central park. Malice of that sort, from that sort of group, is a perennial expectation. Much more interesting - and more relevant to the currently fractured state of American society are the challenges from the right wing of American politics. After all, as JFK is alleged to have said, "we get our religion from Rome, but our politics from home." There is, for example, the case of Arizona Republican Congressman Paul Gosar, who calls himself a "proud Catholic," but plans to boycott the Pope's Address to Congress on the grounds that the Pope has "adopted all of the socialist talking points." Then there is something called the Heartland Institute, an outfit whose Marketing Director has equated "environmentalism" with "nature worship" and who worries that, "if we have a pope who doesn't view things in an orthodox manner, we're going to have forms returning to religion that are not orthodox." And one Philadelphia talk-show host has supposedly said, "The pope does seem to be enamored with solutions that are not pro-American in the slightest." One obvious response to such strange statements is, of course, to note that the Pope represents a multi-cultural, multi-lingual, world-wide institution, only some 6% of whose members are in the United States. So even in purely secular terms, why should anyone expect him to reflect a particularly American perspective - let alone a right-wing American perspective that is so self-consciously at odds with moral, social, and scientific thinking in most of the rest of the world? Then add to that the even more important fact that what the Pope represents is a religious alternative to humanity's dominant ways of thinking and acting. Should anyone be surprised that who the Pope is and what he stands for represent such a total challenge to the US moneyed elite's talking points? Actually it is Will's rhetoric that is somewhat excessive, or should i say "flamboyant"? Still Will is certainly a serious thinker. And so (despite his ideology-driven rhetoric) he manages to raise certain points which actually ought to be taken seriously at a certain practical level. There is, for example, the undeniable historical reality that it is only modern economic growth that has made it possible for many more people than ever before to escape poverty, which prior to that was widely seen as just the natural lot of almost the entire population. It is also the case, as Will notes, that this history of economic growth that has facilitated this incredible improvement in the living standards of such a significant part of the world's population has been made possible largely by fossil fuels. Of course, none of that addresses the physical damage done to the world by the use of fossil fuels - nor the moral damage done to humanity by capitalism and consumerism. Hence the importance of a religious alternative to humanity's dominant ways of thinking and acting, which is what the Pope will hopefully provide. That said, the practical problem of discerning politically possible, economically effective, and sociologically sensible policies to address current material problems remains a real one, which no policy-maker or statesman or citizen can simply dismiss. In contrast to George Will's Washington Post column, a more balanced (certainly less polemical) attempt to address such concerns is the more measured essay by William D. Nordhaus, "The Pope and the Market,' in the October 8 issue of The New York Review of Books. (See http://www.nybooks.com/articles/archives/2015/oct/08/pope-and-market/.) Nordhaus applauds the Pope's commitment to the environment and hopes that "his endorsement of climate science and the reality of warming and environmental damage will be effective in turning the tide toward strong actions." But, at the practical (or as is sometimes said in church-speak, prudential) level, he fears that Pope Francis "has missed a unique opportunity to endorse one of the two crucial elements of an effective strategy for slowing climate change." Nordhaus considers it "unfortunate" that the Pope "does not endorse a market-based solution, particularly carbon-pricing, as the only practical policy tool we have to bend down the dangerous curves of climate change and the damages they cause." It is to be hoped that at the very least one consequence of the Pope's challenging call to conversion of heart will be a greater openness by policy-makers, statesmen, and citizens in making their prudential policy judgments to evaluate the practical policy tools that are already available (which in terms of the US situation would itself already be an almost utopian transformation from the present policy impasse). Pope Saint John Paul II's historic January 1998 trip to Cuba may be best remembered in the US for how the media quickly packed up and came home when the Monica Lewinsky scandal broke - an event of transparently greater world-historical significance to the scandal-obsessed parochial American media. As for Pope Benedict XVI's 2012 visit to Cuba, the American media little noted nor long remembered it. But, with Pope Francis' current trip to what JFK famously called "that imprisoned island," the coverage is likely to be different. Partly that is due to the media's greater interest, indeed fascination, with the personality of Pope Francis (filtered for the most part through its own narrow lens of religious and historical ignorance and ideological preconceptions). Partly that is due to the evolving relationship between Cuba and the US (with the recent restoration of diplomatic relations itself having been facilitated by the Holy See). And largely that is due to the Pope's deliberate linking of his trip to Cuba with his visit to the US later this week. If nothing else, that linkage ought to remind Americans that (despite how we understandably see ourselves) the US is not the center of the Pope's world. 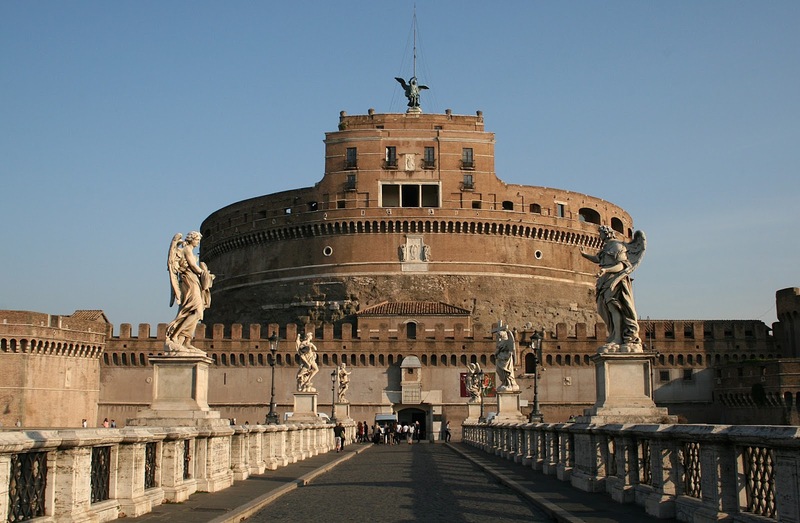 Indeed, if the World Meeting of Families' triennial meeting weren't happening here this year, it is quit likely that the Pope might not be coming to America at all. Unlike his three most recent predecessors (Blessed Paul VI, Saint John Paul II, and Benedict XVI), this Pope has never ever visited the US and seems to have shown no interest in ever doing so before. And it is actually possible that - as a Latin American - he may even consider his visit to Cuba to be as important or maybe even more important than the US part of his trip (especially if we subtract from the US visit the not specifically American, more international events of his trip - i.e., the Meeting of Families and the Address to the UN). Actually, even the specifically Cuban component of the Pope's visit got relativized within the larger context of Latin American concerns at yesterday's Sunday morning Mass in Havana's Plaza de la Revolucion, when the Pope addressed the ongoing negotiations going on in the Cuban capital between Colombia and the FARC rebels. "We do not have the right to allow ourselves yet another failure on this path of peace and reconciliation,” the Pope said in regard to those negotiations. There was a time - prior to the collapse of Soviet communism - when Cuba, as the Soviet Union's expensively subsidized colony in the Western Hemisphere, was a political threat to the rest of Latin America. But, since the end of the Soviet Empire left Cuba as an isolated outpost of nothing, it has become instead a very visible example of economic failure - a model obviously not to be followed. As with the restoration of diplomatic relations between Cuba and the US, so too with the Pope's visit, every development in the Cuban story is certainly seen as an opportunity for hope - hope for some real and much needed change in Cuba's sad situation. Along with the Cuban people, most of whom must be getting more and more tired of Castroism's failed promises, we can only hope that the Pope's presence will be more than symbolic but will be a real harbinger of needed change. Even more so for the long-suffering Cuban Church, which struggles for the freedom it needs to begin the re-evangelization of that once-Catholic country, which first received the Gospel over 500 years ago. We’re all familiar with that famous photograph. It is on display here today. There is another copy downstairs in the parish hall, with a chart that attempts to identify many of those in the picture. It appears in books about the city of Knoxville and the history of the Church in Tennessee. There is even one hanging in the Chop House restaurant in Fountain City. The photo was taken on September 26, 1886, one week after the dedication of this church. The pastor, Fr. 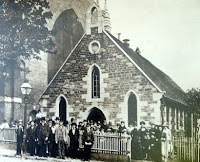 Francis T. Marron, and a group of parishioners – very serious-looking as 19th-century people always were when they posed for a picture – stood, facing Walnut Street, in front of the original Immaculate Conception Church, soon to be torn down so that the apse and altar area of the new church could be completed. Three years ago, inspired by that old photo, we gathered as many of us as we could in front of the present parish church, facing Vine Avenue, for another picture. There are more people in the second picture, and they look less formal. They’re even smiling! But, for all the superficial differences, both pictures complement each other very nicely. Both photos express the essential dimension of our parish’s life. We are a diverse community who together embody the Church on this particular site in downtown Knoxville. We come from various backgrounds and go about our daily lives in differing professions and other activities. But we all come together here in our church, to which we bring our joys and hopes, our experiences and our challenges, where we hear God’s saving and redeeming word and are nourished from his altar by his sacraments - so as to be sent forth from this church refreshed, fulfilled, and empowered to continue Christ’s life and work in the world through the mission of the Church here in this city. Saint John Paul II once called the parish “the Church living in the midst of the homes of her sons and daughters.” Elaborating further on this theme, Pope Francis has called the parish “the presence of the Church in a given territory, an environment for hearing God’s word, for growth in the Christian life, for dialogue, proclamation, charitable outreach, worship and celebration … It is a community of communities, a sanctuary where the thirsty come to drink in the midst of their journey, and a center of constant missionary outreach” [Evangelii Gaudium, 28]. Can it indeed be, asked Solomon when the Temple was being dedicated in Jerusalem, Can it indeed be that God dwells on earth? [1 Kings 8:22-23, 27-30]. Certainly, Solomon’s wonder and amazement must have found an echo in the heart of the tax-collector Zacchaeus, when Jesus looked up and said m, Zacchaeus, come down quickly, for today I must stay at our house.” And what did Zacchaeus do? He came down quickly and received Jesus with joy. My guess is that the reason this Gospel passage [Luke 19:1-10] was proclaimed for so many centuries at the Mass of the Dedication of a Church was because of Jesus’ wonderful words near the end: “Today salvation has come to this house.” Zacchaeus certainly needed salvation. Certainly he needed something. Otherwise why would he have been willing to risk ridicule by running ahead and climbing a tree. (If you go to Jericho today, they’ll show you the tree.) Certainly Zacchaeus needed something. Otherwise why would he have been willing to risk the grumbling of his somewhat self-righteous neighbors, who just didn’t quite get it, who just didn’t quite get what Jesus was all about, what Jesus is all about, and what his Church therefore is all about. Zacchaeus received Jesus with joy. A church is a place set apart for that to happen, over and over again. A parish is a community, centered on a church, that exists to help that happen, over and over again. This is what Immaculate Conception Church in downtown Knoxville (“The Church on Summit Hill”) has consistently been all about ever since those very first families founded the parish and opened the first Catholic Church in Knoxville on this site 160 years ago, in the fall of 1855. When we celebrate a church, we first of all celebrate a place, a very special and sacred place set apart unlike any other. We also celebrate the people the place represents. That is why the anniversary of a church’s dedication is celebrated liturgically as a feast for all those whose church it is. But, when we celebrate this our mother church of East Tennessee, we also celebrate the relationship that binds us all together over time and space. And so, in gratitude for these past 160 years of fruitful parish life and ministry on this hill and in downtown Knoxville, we remember those who have gone before us, who lived lives filled with faith, hope, and love, and now rest in the peace of Christ. And we especially welcome to our church this Sunday all former Immaculate Conception parishioners and all descendants of the founding families of parishioners who are attending this special “Parish Homecoming Mass” today. Brought together as one parish community from many places and backgrounds, we pray that we may continue to share the blessings of our Catholic faith and life with all who live or work or visit within sight of this church, within the sound of its bells, and within the reach of its members. Homily for the Parish "Homecoming Mass" in Celebration of the 160th Anniversary of Immaculate Conception Parish, Knoxville, TN, and the Anniversary of the Dedication of the Present Church (1886), September 20, 2015. One thing most people can probably agree on about last night's Republican debate was that it was way too long. Three hours are a burden both for those watching and for those participating. I didn't watch the preliminary "kids' table" debate, but for anyone who did that added two more hours. I think two hours should be enough - for one debate. As for the candidates forced to stand there for three hours (some of them ignored for much of that time), one could almost feel sorry for them, if only any of them were at all sympathetic! That they certainly are not, although some did distinguish themselves as moderately more rational and moderately more humane than some of the others. I'll leave it to professional political pundits to appoint winners and losers. The only winners I could see in the overall spectacle were the Democrats. That said, I think there were occasional deviations into serious political discourse, moments when serious policy matters were being addressed in a reasonably serious way by at least some candidates. John Kasich remains fixated on the fetish of a balanced budget, but other than that he showed himself reasonably serious and worth listening to. Carly Fiorina said women really ridiculous things - like about not talking to Putin, but generally seemed to have at least a good knowledge of the the major issues. She also spoke eloquently about the evil organization that is Planned Parenthood and what it says about our character as a society. (The You Tube video to which she was apparently referring may have been this one: https://www.youtube.com/watch?v=FzMAycMMXp8) And, of course, she delivered one of the night's most memorable lines in rebuttal to Trump's earlier insulting comment about her face. Rand Paul also distinguished himself, notably in his critique of the so-called "war on drugs." In context, Jeb Bush's admission that he had smoked marijuana 40 years ago - instead of maybe making him seem more down to earth - actually highlighted his privileged background in contrast to the multitudes incarcerated thanks to the so-called "war on drugs." Much of the evening was a combination of narcissism and fantasy. One particularly low point was the silly debate between Trump and Fiorina about how personally successful they had each been in business. Chris Christie called them on that, as something an unemployed worker would not care much about. But, of course, success as a capitalist is part of how those two define themselves. Another especially low point was Trump's continuing to link vaccines and autism. the two doctors on stage sort of rebutted him, but rather lamely, pathetically so given that this was an obvious opportunity for them to have used their professional expertise. Carson lamely said that numerous studies have shown no correlation, while Paul endorsed vaccines but qualified it by being "also for freedom." And then there was Marco Rubio, ruling out doing anything about climate change because such action would wreck our economy - as if climate change won't also wreck the economy for most people on the planet, except, of course, the very rich who will have the resources to weather the storm. Or was that his point - that the economy he cares so much about is supposed to be mainly just for the benefit of the very rich, whose interests must therefore always be given precedence over those of everyone else? During the breaks in the debate, I was paging thought the latest issue of The Princeton Alumni Weekly, which contains a short article called "Politics: Swaying Voters." A brief commentary on some academic work on the subject of voters and elections, it seemed a fitting commentary on the current campaign. Peace Comes of Age - To What End?